Jenny Hsieh with some of UTSA's brain health grant winners. (Oct. 19, 2018) -- The UTSA Brain Health Consortium (BHC) is an interdisciplinary team encompassing faculty and researchers from the Colleges of Sciences, Engineering, and Liberal and Fine Arts, that uses the power of stem cells and precision medicine approaches to know the nature of brain disorders and translate this knowledge to improve patient lives. To be eligible, graduate students had to be currently enrolled in a master’s degree or a Ph.D. program while postdoctoral fellows had to have four years or less of postdoctoral training. A panel of UTSA faculty reviewed the applications, including Hsieh, Christopher Navara and Zane Lybrand. After careful scrutiny, the following scholars were each awarded $15,000 with their funding beginning November 1, 2018 until June 30, 2019. Originally, the BHC had funds to allocate three seed grant awards. The College of Engineering then joined and matched the funds so that a total of six awards could be given. 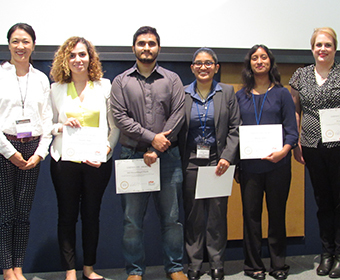 The awardees were also publicly recognized at the recent 2018 College of Sciences Research Conference. “Molding and advancing the next wave of regenmed and neuroscience investigators, research areas for which UTSA and the city are renowned, is critical as we build the talent pipeline. With funding and mentoring, our students will have the necessary skills and investigative mindset to be successful once they graduate,” concluded JoAnn Browning, dean of the UTSA College of Engineering. Learn more about research at UTSA.